Arvika sets the stage for round two of the 2018 RallyX Nordic season with all eyes on championship leader Thomas Bryntesson to see whether he can maintain the momentum from his perfect start to the season. The JC Raceteknik driver kicked off the defence of his RallyX Nordic title in fine style with a fighting display in round one at Holjes. 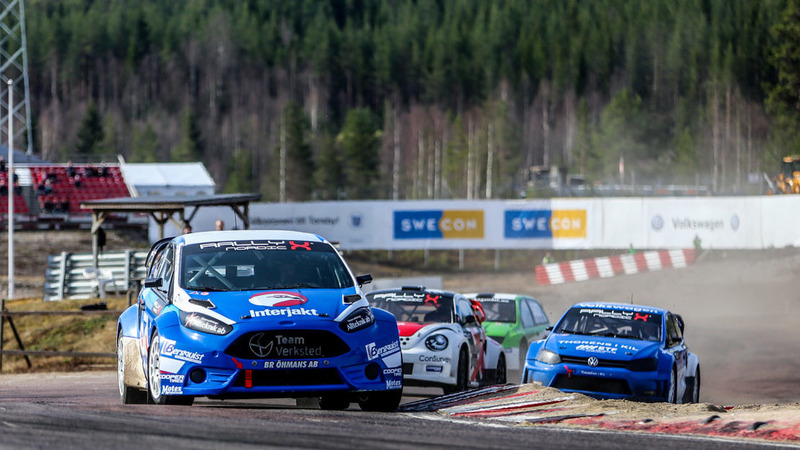 Bryntesson bounced back from a crash at the wheel of his Ford Fiesta during an earlier qualifying race to claim a comprehensive win over a high-quality field in the final. Leading Helmia Motorsport’s Lukas Walfridson and Mats Ohman across the line, Bryntesson returns to Sweden for round two in Arvika looking to protect and extend an early four-point lead over the opposition. Technical and challenging, Arvika is a mainstay of the RallyX Nordic calendar and is known for producing competitive door-to-door action, with this year’s event primed to continue the thrilling racing trend displayed in Holjes. Indeed, while Bryntesson may have emerged as the familiar figure atop the podium, the close competition of round one nonetheless points towards multiple drivers being in contention for this year’s sought after RallyX Nordic title. Similarly, Oliver Solberg in the OSRX Citroen DS3 and Olsbergs MSE’s Oliver Eriksson will seek greater fortune after eye-catching flashes of performance in Holjes didn’t translate into the desired results on track. Even so, both have reason to be confident ahead of round two with Solberg having claimed victory in Arvika twelve months ago, while Eriksson arrives on the back of a big win in the RX2 International Series at Silverstone’s Speedmachine. Other drivers in the hunt for glory include Philip Gehrman in his Eklund Motorsport Volkswagen Beetle, the young Swede having also reached the final in Holjes, while Ola Froshaug in the second JC Raceteknik Ford Fiesta and Hedstrom Motorsports’ Christer Dalmans will look to replicate their run to the final in Arvika twelve months ago. The competitive Supercar Lites cateorgy continues in Arvika with Guillaume De Ridder looking to continue his winning feeling following success in Holjes. The Olsbergs MSE driver was the dominant winner last time out but faces a renewed challenge from an impressive 20-strong entry list, including fellow Holjes podium-winners Linus Ostlund and Glenn Haug, plus defending champion and last year’s Arvika Supercar Lites winner William Nilsson. Round two will also feature two series newcomers in Arkadiy Tsaregradstev and Troy Dovel, competing with SRT and Set Promotion respectively.